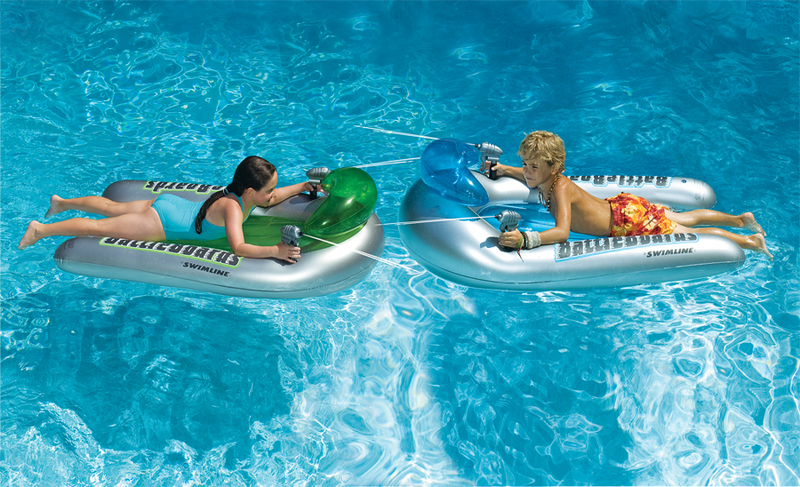 Check out these Inflatable Water Toys from Swimline! 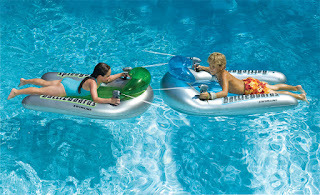 Summer will be here before you know it, so why not start thinking of some cool water toys to use when you go swimming? Swimline has a wide range of awesome products and they have provided me with a few of them to review. First we have the Double Action Air Pump. 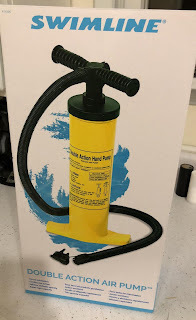 If you're going to have inflatable water toys, then a pump is a must. And this is a really good one. It comes with an assortment of nozzles. Swimline has several styles of air pumps and you can browse their site and search for one that suits you. 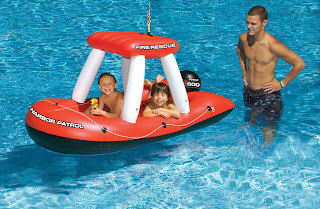 Next we have the 60" Fireboat Inflatable Ride On Water Squirter. This vinyl boat is red, with white columns. It has "Fire Rescue" and "Harbor Patrol" printed on it. This boat is big enough for two small children and is recommended for ages 4 and up. The cool thing about this is that it has a squirt gun which pulls the water directly from the pool or lake, so no more running out of water and needing to refill in the middle of a battle. Kids can pretend to be the Harbor Patrol Fire/Rescue Unit, putting out imaginary fires and rescuing their friends from boredom. The Fireboat retails for $52.99, but right now you can get it for $24.99 HERE . Next we have the Power Blaster Dual Squirter Set. You get two 42" vinyl tubes, one blue and one red/orange. 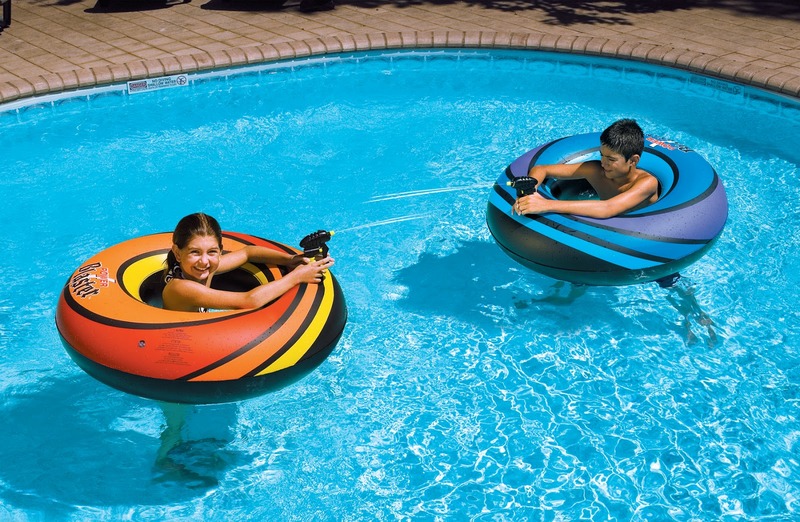 Each one is equipped with a squirt gun that you will never need to refill because it pulls the water directly from the pool or lake that you are swimming in. They are very easy to inflate and deflate with simple stem valves. Kids will have a blast floating around and waging a water war with each other. 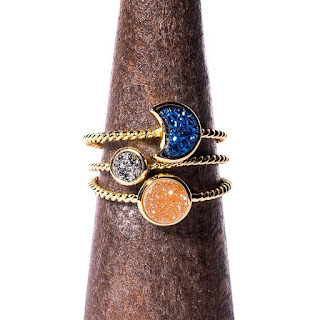 This retails for $37.50, but right now it is $19.95 HERE . Next we have the Battle Board Squirter Set. You get two boards, one blue and one green. Each has a weight capacity of 175 lbs. Each board comes with not one, but TWO built in squirt guns! 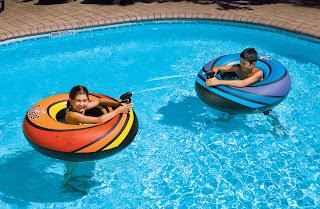 Like the Power Blaster and Fireboat, the squirt guns pull the water directly from the pool or lake. 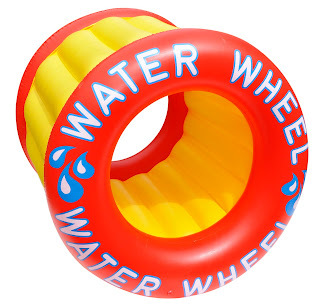 You can get into some serious water battles and epic fun with these! The Battle Board set retails for $49.94 and you can purchase it HERE . Last, but definitely not least, we have the Water Wheel. Kids love this thing! It's red and yellow and measures 43" long, 40" wide and 40" high. It is suitable for kids age 9 and up. They can get inside it and crawl around on top of the water. They are sure to have hours of fun with this. 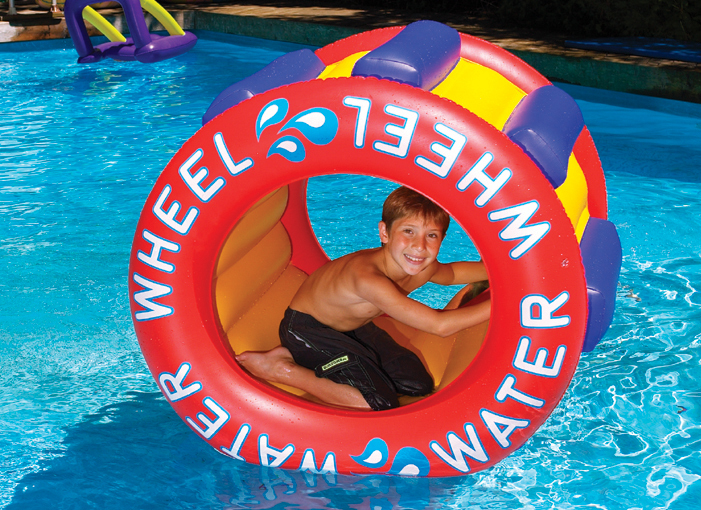 The Water Wheel retails for $53.99 and you can purchase it HERE . Swimline is kindly providing us with a Water Wheel to give away to one of our lucky readers. So make sure you get your entries in once the giveaway is posted!